Make a plan for your money with Financial Peace University. We all know good friends can be harder to find than a missing sock in the laundry. And even when you do find a great friend, they can be pretty tough to keep! No one person is to blame. Long-distance moves, busy schedules and daily routines just get in the way sometimes. But you have more power than you may realize to be a friend who’s there across time and distance. It’s easier than you might think! It comes down to showing friends you truly appreciate their friendship. And some of the most thoughtful appreciation comes in the smallest of gestures—things you can do even when you’re busy or live a plane ride away. 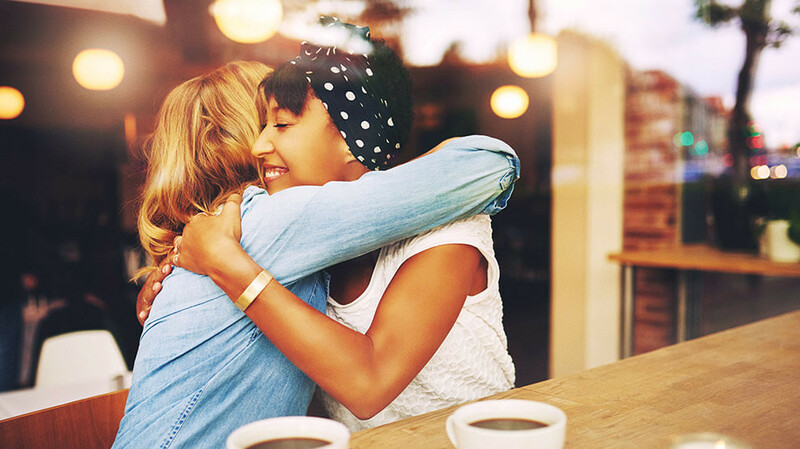 If you’re looking for ways to nurture the friendships you’ve worked hard to build, try these four easy ways to show you care. 1. Speak the unspoken in tough times. Unless you’re really close to someone, you might not want to talk about the messy, emotional stuff going on in their life. That’s what makes great friends great: They’re not afraid to dive in when others run away. So instead of speaking about your friend in a group of other mutual acquaintances (“She’s doing so great despite everything that’s happened!”), talk to your friend yourself. Because the truth is, they might not be doing great—they just don’t want to burden casual acquaintances with their trouble. So embrace the discomfort and let your friend know you’re there for them, even in the hard times. Ignoring problems doesn’t make them less painful for your friend . . . it just makes the situation less awkward for you. Real friends aren’t afraid of a little discomfort if it means being there in times of need. Embrace the discomfort and help carry the burdens others ignore. 2. Remember the small things. We all long to be noticed, to be seen, to be recognized. And that’s exactly how we feel when someone does notice a personal detail about us and acknowledge it later. Try to be more intentional about doing this for your friends. For example, when everyone else is bringing your friend doughnuts to celebrate his promotion, bring him the bagels he actually prefers. Or surprise your friend with vanilla cupcakes and tea on her birthday because you know chocolate gives her headaches and she doesn’t like coffee. You get the idea. And remember this: Thank your friend when they do something nice for you. Seriously. Expressing genuine gratitude lets them know their thoughtfulness was worth it—and that they matter to you. 3. Make time for what's important to them. In Philippians 2:3 (NIV), Paul tells us, “Do nothing out of selfish ambition or vain conceit. Rather, in humility value others above yourselves.” When it comes to friendship, that means showing your friend you value their opinions and desires above your own. They love baseball but you love football: Surprise them with tickets to an MLB playoff game, even if you’d rather cheer for your favorite NFL team from the couch that day. They’re a homebody, but you love a party? Invite them over to eat popcorn and binge watch your favorite TV show—even if you’d rather head out on the town. 4. Reach out the old-fashioned way. We all know it’s true: Social media can make us lazy communicators. Instead of remembering a friend’s birthday and sending a card ahead of time, we wait for Facebook to remind us the day of, and then we post a quick Happy Birthday! Done, but not meaningful. Instead, reach out in a way that takes time, thought and planning. If you live close enough, grab coffee or lunch together every few weeks, or pick up the phone to call or video chat. It might even help to set up a regular time on your calendar to do it. That can feel formal and impersonal, but it keeps you accountable and actually fosters a deeper friendship. If your friend lives far away, send them some fun snail mail. Make it colorful, creative, personalized and “just because.” There’s nothing more exciting than opening your mailbox to find a surprise like that waiting for you! Few things in life are better than a really good friend. Be that person to your own close friends by showing them how much you care! Make a plan for your money with Financial Peace University. Learn More.